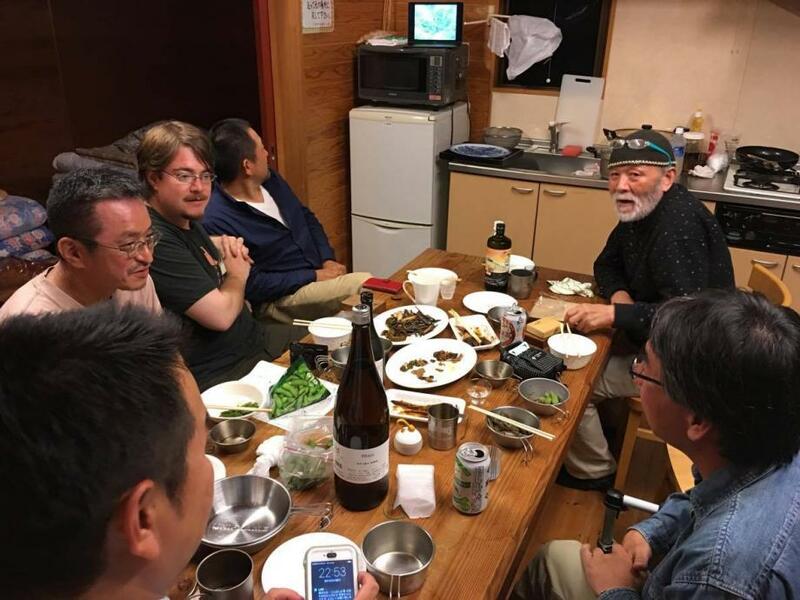 In middle of last September, around the end of keiryu fishing season, we had 2 American guests visiting “Tani no Okina, Sebata-san” who was staying at the historic house “Kanouzu Bansho” in Tadami-town of Aizu. One was well-known administrator of this web-site “Tenkara Fisher” Mr. Adam Trahan, and other was very keen tenkara fisher Mr. Adam Klagsbrun. So some of my friends and I gathered at Tadami to welcome them and to guide them a few days of fishing. Those days Sebata-san had not been feeling well and could not go fishing with them unfortunately, so we had decided to guide them to genryu fishing as Sebata-san’s substitute. This event became our biggest fishing event of this year and I was very much looking forward to joining them. 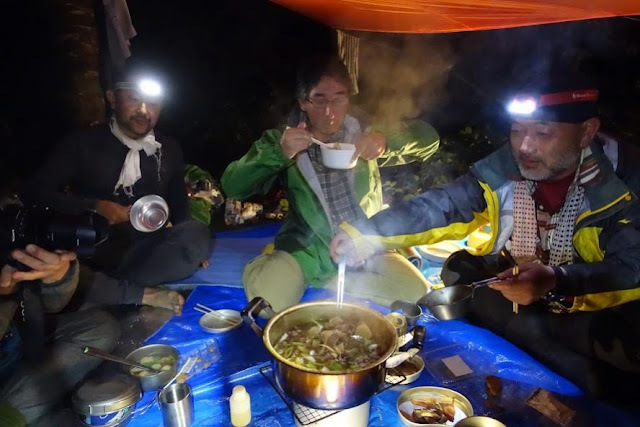 On Thursday night 15th September, we gathered at the cabin of Tadami Youth Travel Village Camp-ground in Tadami, as we could not stay at Bansho for first 2 nights because Bansho was booked for some another event. Both Adam-san stayed in Tokyo and enjoyed shopping and sightseeing for a few days and Go-san (Mr. Go Ishii) was taking them to Tadami with his car. There were also Kura-san (Mr. Kurahashi) and Yamano-san (Mr. Yamano who is a bamboo rod builder known as “Saoshosaku”.) and of course Sebata-san. When I arrived at the cabin by 3 hour drive after finishing my work, they were already drinking well and looked so happy. I joined them immediately and we toasted. As we had 2 Adam-san, Go-san told me that we would call Mr. Trahan “Adam-san” and Mr. Klagsbrun “Adam-chan”. I said it was good idea. My friendship with Adam-san had been like 4 or 5 years but it was first time to meet him. We are about the same age, and our interests match well, for example fishing or music. So I got a close affinity from around acquaintance, and that is why now I am writing this genryu story for “Tenkara Fisher”. We talked many things on internet during the years, so I did not feel it was our first meeting. Adam-chan was a young guy and had very bright personality. I really liked his character soon. We had to wake up at 5:00 am in the next morning, but we forgot the passage of time and talked a lot. On Friday, Ito-san (Mr. Ito) joined us in the very early morning and we went to a day fishing to Takizawa-gawa which was about 15 minutes north of Tadami town by car. The weather was cloudy but it did not look it would rain. We parked the cars and walked zenmai-michi (Zenmai trail) on the cliff along the stream for about 20 minutes and went down the stream. As we had less rain those days, the water level of the stream was about 2/3 of normal level. Everyone fished iwana soon, but only small ones and fishing condition was not so good. I was bit frustrated. We finished fishing by noon and had lunch on the beach of the stream, and we went back to the cars. We dropped in the local public onsen bath on the way back to the cabin. It was very good onsen and Adam-san and Adam-chan looked enjoying bathing very much. When we went back to the cabin, Sebata-san was preparing the foodstuff for the dinner, and I found some Maitake (Hen of the wood). I was very happy to see that. Wild mitake is the best mushroom for the season. In the evening Maruyama-san arrived and joined us. Maruyama-san is a very famous photographer and he has been one of the main photographer for Keiryu (Headwaters magazine) for many years. Sebata-san called him to cover our genryu fishing trip for Keiryu magazine. 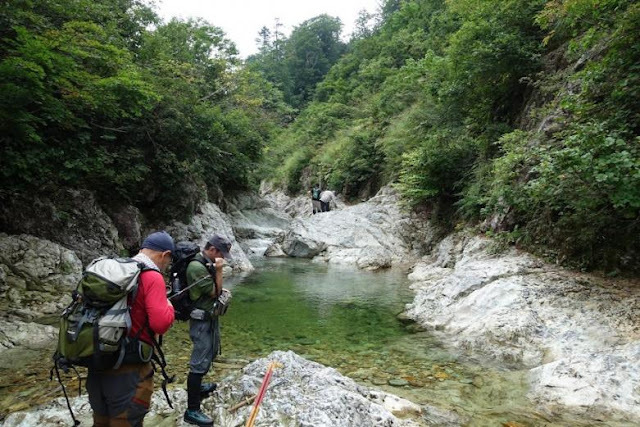 We had planned 2 days genryu fishing camp to a stream called Akakuzure-zawa on Saturday and Sunday, but again we drunk and talked a lot until midnight despite we had to wake up 5:00 am in the next morning. Akakuzure-zawa is one of tributaries of Kanouzu-river which is also the tributary of one of the biggest rivers in Tohoku Tadami-river. We woke up at 5:00am on Saturday morning. It was still dark but as we prepared the packing our back-packs the night came dawn brightly. We said good-bye to Sebata-san and got in the cars and drove to the parking at climbing gate for Asakusa-dake (Mt. Asakusa). It only took us about 10 minutes. We checked the equipment and foods finally. I ate a quick breakfast. Then Kozue-san and her husband came with 2 cars. It was because the road from there to up stream of Kanouzu-river was blocked by gate and only local people had keys and were allowed to enter. Yes, they only came there to offer us the lift to the place where we went down to the stream. We appreciate their kindness very much and got on the car and small pick-up truck. The sky was still covered with clouds but it did not look rain soon. In about 10 minutes we arrived at the place where we went down to the river. We all thanked Kozue-san and her husband and took our backpacks and went down to the river through narrow trail. It was very short trail but covered with many big beech trees. We enjoyed typical atmosphere of approach to genryu in the beautiful forest. 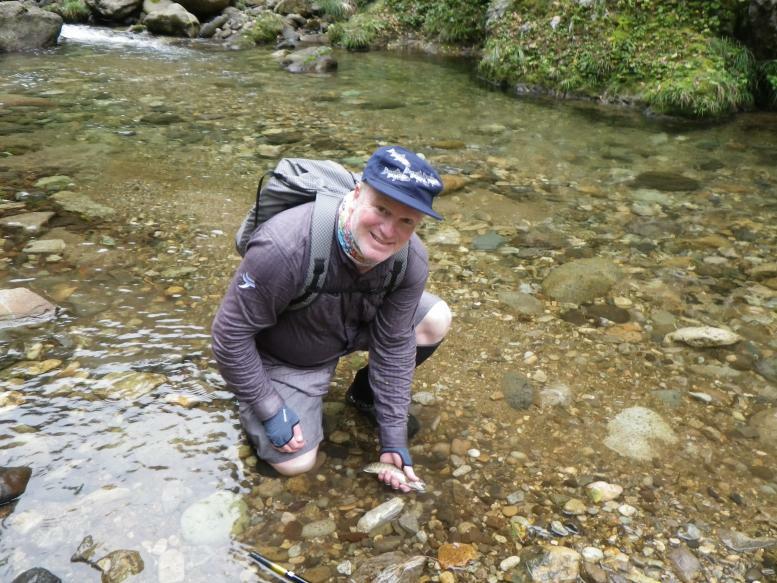 Soon after, we started wading Kanozu-river up-stream. Again the water level was very low but it made wading very easy. We got the confluence of Kanouzu-river and Akakuzure-zawa in about 20 minutes. Akakuzure-zawa was beautiful and gentle mountain stream. We had chosen Akakuzure-zawa because Adam-san and Adam-chan even Go-san had never been to real hard genryu. So we thought Akakuzure-zawa was the best stream because the stream was flat and there were no dangerous places in the stream. Current of the stream was very calm, too calm due to the low water on that day. I was very much worried about fishing. As soon as we entered Akakuzure-zawa, Maruyama-san gave us go-sign for fishing. Adam-san and Adam-chan started casting one by one but there was no bite at all. Sometimes small iwana just ran spooked by us. That was all. They only had couple of bites each but no hooking. We arrived at tenba (camp site) by 8:00am. It looked nice tenba on the bank of the river in the beautiful forest. We just cut some grasses and throw woods and branches to make up the ground nicer. We set 2 tarps and put 2 large blue sheets, and we got comfortable tenba in 15 minutes. We were released from heavy backpacks and took a short rest. 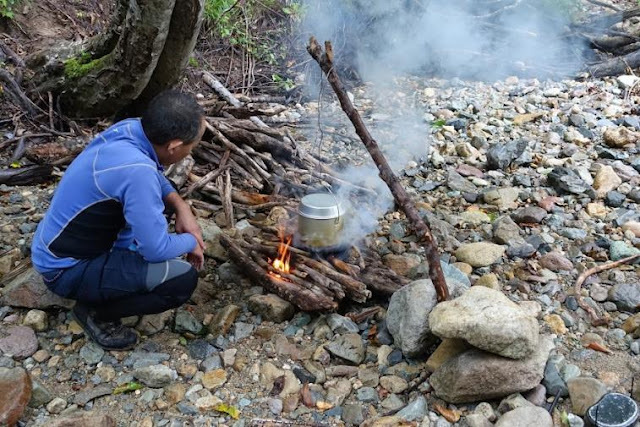 After a while we put fishing tackles and lunch in small day-packs and left tenba to up-stream for main fishing. 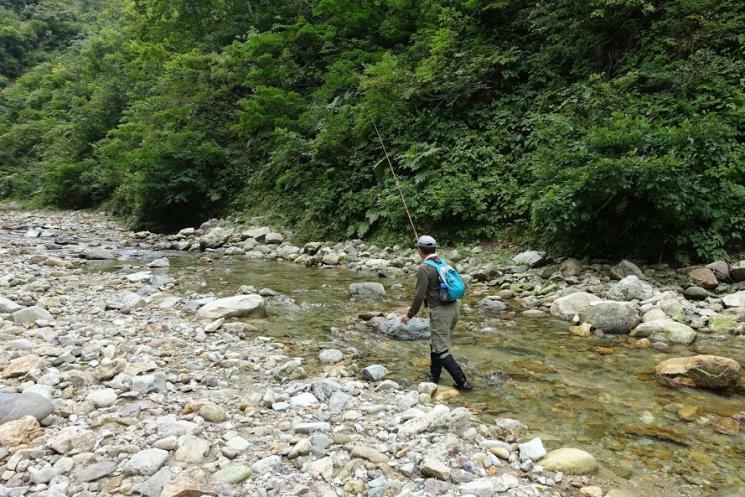 Soon Adam-san fished nice sized iwana in the small tributary, and strikes of iwana increased from there. Adam-chan also fished a couple of small iwana. I saw Adam-san cast in a very smooth timing making beautiful loops of the line. He was then using Nisshin’s ultra-mobile rod. I thought Adam-san’s choice of the line and the rod was very well balanced. 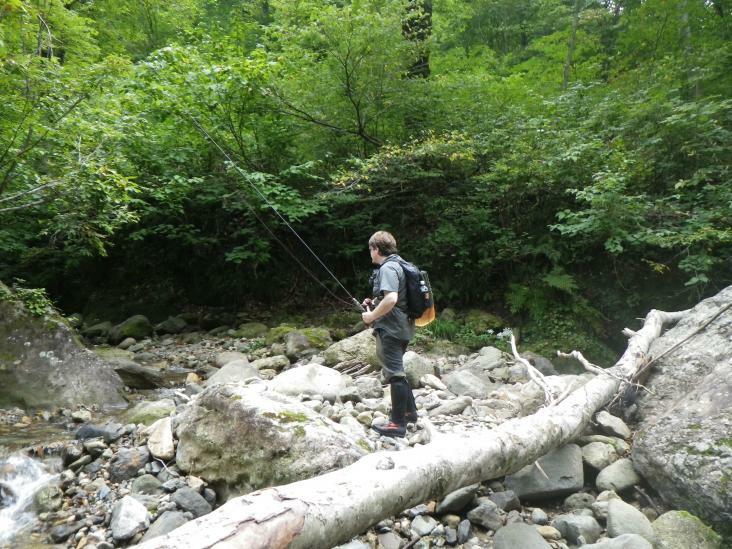 I admitted he was a life-long fisherman and understood tenkara fishing system very well. I wanted him to fish more iwana, but he was so gentle and gave the turn to others after one catch. Ishii-san, Kura-san, Ito-san and Yamano-san all fished after Adam-san and Adam-chan got some iwana. Everyone looked very experienced fishermen but they did not get strikes well. As they all were using traditional tenkara kebari and sank them, I just wanted to test dry type kebari. I set my rod and tied a dry fly, and asked to fish. There was a very good looking small pool. I stoked carefully and cast the kebari on the slow current of the pool, but nothing happened. I did cast 5 or 6 times on different lines of the current but had no reaction. So I gave up the point and waded upstream toward to the next pool at the vent, but I was a little concerned about the small deep riffle on the opposite shore. So I cast a kebari on the current there, then iwana got the kebari right away, and I fished good sized iwana. I thought it was a dry fly day. In Japan we sometimes have that kind of day especially in August and September when there are very few nymphs in a stream. I told everyone about that but I did not see anyone changed kebari. Fishing was slow but we fished some more iwana and arrived at 10m water fall around noon. There was a big pool under the water fall, and it looked great point to get big one. Adam-san and Adam-chan both cast kebari apart from each other. After several casts Adam-chan’s rod made a large arc. He enjoyed the fight with nice sized iwana and landed the biggest iwana of the day. It was nearly 30cm. Beautiful iwana. We decided to keep that iwana for sashimi. To be honest I expected everyone could fish couple of that sized iwana until the water fall. Genryu fishing is normally like that, but we did not have good luck on that day. Time was just right. We decided to have lunch there by the stream looking at the water fall. The weather was mostly cloudy but at lunch time the sun came out a little. We boiled the water and made instant ramen, and we also had some bread. We did not have time to make onigiri but that was typical genryu lunch. 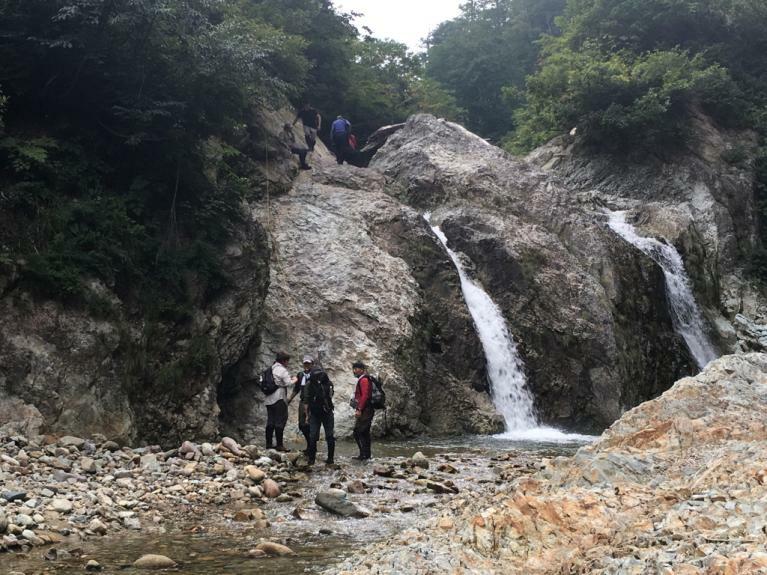 Sebata-san said we did not need any ropes to wade Akakuzure-zawa, but I talked with Maruyama-san and fixed support rope at the cliff by the water fall because some people were not so used to do rock climbing. I was looking at everyone climbing the water fall, and Adam-chan was climbing very well. He was young and his wading and rock climbing were very smooth and strong. I thought he could go real tough genryu in a remote area climbing over mountain ridges. The upstream from the waterfall, there was beautiful flow of typical genryu continued, but the fishing was not so good. We soon arrived at the second water fall. There was also a nice looking deep pool under the water fall. Adam-san and Adam-chan cast one by one also Kura-san and Go-san tried but there was only silence. We climbed over the water fall and continued fishing. We caught some iwana but mostly small ones. In about 30 minutes we had reached the very wide flatland which was very rare in the deep mountains like there. That place was called Akakuzure where mountain people had 9 zenmai-goya (Hut for zenmai hunting) in time past. It was also the origin of the name of the stream. Surprisingly we met 2 anglers who had just arrived there. They came Akakuzure climbing over mountains taking ancient zenmai-michi (Zenmai trail). In fact they are friends of Maruyama-san’s. They said the trail was nearly vanished and it took them more than 5 hours to reach there. Everyone was very surprised to hear that but Maruyama-san and I thought it was nothing special. We do that to get to genryu regularly. We talked with them and we would do fishing together. Adam-san and Go-san wanted to have rest there. Rest of us fished with them for another 30 minutes but we had very few strikes and water was getting lesser. So we decided to end up fishing and went back to the tenba. We arrived at the tenba by 4:00pm. We changed the wet close and shoes and started each work shortly. Ito-san and Yamano-san started preparation for dinner. I gathered fire woods with Adam-san and Kura-san. Maruyama-san was teaching how to make sashimi to Adam-chan. We made bonfire and Maruyama-san set 2 hango to cook steamed rice. It seemed everyone was enjoying their works. When the rice was cooked and Ito-san set the big pot on the cooking stove, it started to rain. So we decided to have the party under the tarp on the blue sheets. We did “kanpai” with beer and talked about fishing today. I cooked yakiniku (Japanese style BBQ) and there were also sashimi of Iwana, Japanese pickles, snacks etc. The rain got harder and some people were little bit worried about rise of a stream, but it was no problem from my experience and I told them so. Japanese hardwood forests have a very good water retention capacity, and it prevents water increase very well. After some while the main course of that night “Imoni(Stew of Taro potato and beef. This was famous local cuisine of Ito-san's prefecture Yamagata. )” was served. It was incredibly good. We asked seconds and thanked Ito-san so much. We stayed up at late night and talked about various things, about fishing, nature, Japanese culture, situation of tenkara fishing in USA, jokes. We had drink a lot and laughed a lot. We got in sleeping bags one by one by midnight. I fell in asleep listening to the sounds of rain dropping onto the tarps. Next morning, when I woke up, 2 or 3 guys were already awake. It was still raining but no longer so strong. I looked at the stream and the water level was no problem. It was like 10cm higher than the day before. I thought was just like usual level. Ito-san was starting to cook curry udon(Japanese noodles) using the soup of the imoni from the last night. He said it was classic in his area to cook curry udon in the next morning when they had cooked imoni. Everyone woke up by 7:00am and we had another super nice Ito-san’s special curry udon. Again it was great. We ate all so quickly. We started to strike the camp. 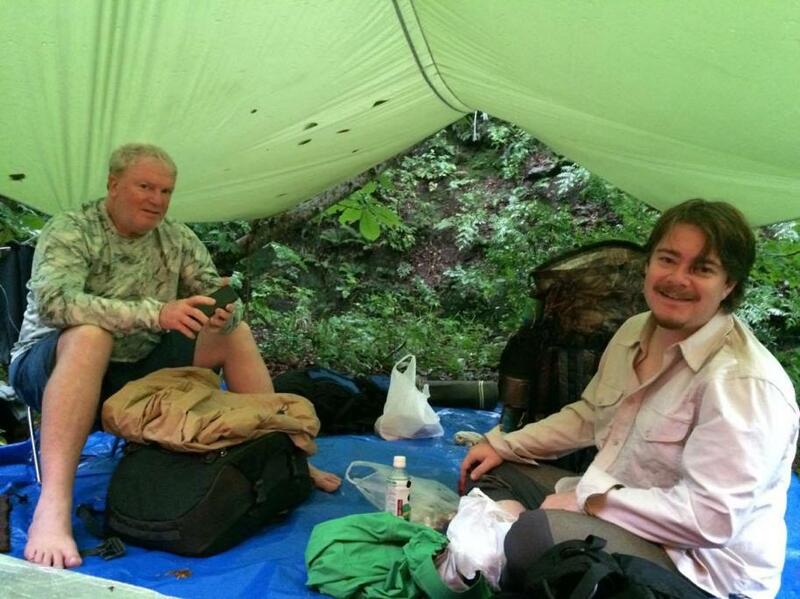 Then 2 anglers walked down from their camp far upstream because of the rain. We told them to go back together. We cleaned the tenba just like before we came. I thanked Mountain God for the safe and enjoyable trip and pray for the safe till the end of the day. We left the tenba and walked down the stream. It was still raining a bit, and as we waded down in the stream, my body was getting bit cold. We had planned to go to another public onsen bath in the afternoon, so I felt like I really needed onsen bathing. After that, Sebata-san, Kozue-san and some other friends would be waiting for us for the party at Bansho in the evening. In the end of September, Keiryu fishing season of this year was only a couple of weeks, but I was fulfilled that I could have one unforgettable memory of genryu fishing camp with Adam-san and Adam-chan.